In addition to what can be learned here at 1911.org, I have found that the website " The Sight M1911-A1 " to be very helpful. If you click on the maintenance section, there are two great articles. The first is "1911 Reliability Secrets" by John Marshall and "Breaking in a New 1911 Pistol" by Syd. Also, I have found the shop manual "The Colt .45 Automatic" by Jerry Kuhnhausen to be very helpful. I think Hawkmoon is correct when he stated that your trigger may clean up after a 1,000 rounds or so, My trigger on my AO .45 PKZE was extremely tight until I shot a few hundred rounds thru it. The gunsmith also noticed the disconnector was moving during the trigger pull. If the disconnector is shifting during the trigger pull, one possible cause might be a sharp unfinished tip on the disconnector leaf on the sear spring. Many types of roughness on parts will smooth themselves out over time. We call this "breaking in". Some other types worsen over time. Parts need to have some minimum preparation to wear properly. I would check to see if the tip of the disconnector leaf has a proper chamfer on its tip, and that the disconnector ramp (spring contact surface) is undamaged. Give us a range report and let us know how it works! Looks like he did a great job! 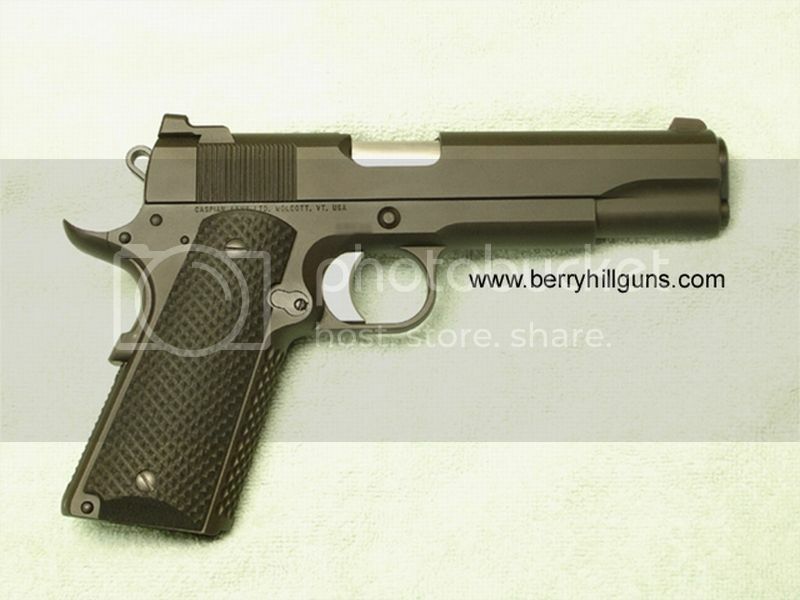 That is a good looking pistol. Like I said earlier, once the bugs are worked out, I think you will come to like this .45 very much! I like the sight picture. The high profile Colt rear site and the high profile “Maryland” front sight work well together. I like the function of the safety. It is unusually smooth. The feel of the pistol in my hands. It doesn’t feel like a “price-point” item. In fact it feels just like my Colts do in my hands. The trigger. The creep is gone, along with wide variations in trigger pull weight. Both in live fire and dry fire it is a pleasure to work with this trigger. The accuracy. I had good groupings on both of the bullseyes I used. Function. I had loaded 64 semi-wadcutter handholds, and 24 semi-wadcutter dummy rounds. The entire day's shooting was a ball l& dummy drill. All 64 of the live rounds fed, fired and ejected. I was using a mix of magazines ranging from brand new to ones from the 1980’s. Now that there is a list of what I like, I feel less inclined to give up on this pistol. Contrary to what happens with my Colt pistols, the ball & dummy drill was frustrating and took a lot of time. About 1/4 of the dummy rounds were difficult to eject. Two of them even required use of a tool to pry them free. They were stuck between the extractor and the ejection port. The same dummy rounds worked perfectly in my Colts. An employee at the indoor range suggested an extended ejector would solve this problem. I plan on discussing this with my gunsmith. An extended ejector will make that problem worse, not better. The problem is that your gunsmith did a nice job lowering the ejection port, but he didn't lengthen it. Once again I thank you, Hawkmoon. I printed out your post, and will be discussing it with my gunsmith. Ejection problem 1 to share.jpg Today I fed all the dummy rounds through one of my Colts with no problems. The attached photo is from my attempt to feed them through the Auto Ordnance. I had to pry this one free because it was wedged in tight. The photo was useful because it gave my gunsmith a really good look at the problem.